When you want to go out to eat, do you ever wish that there were healthier restaurant meals? I sure do! Yes, sometimes, I like ordering a burger and fries just like anyone else might but sometimes, I just want a delicious loaded salad or something lighter. I find that at times, healthier restaurant meals can be hard to find. I am not on a diet or trying to lose weight but after a meal, I don't want to feel awful either. My husband especially feels bad after a heavy meal and therefore, when we go out, we like to go to a place that makes super delicious food that is not too bad for you. I found an app that helps you find which restaurants in your area have the type of food that you are looking for to best suit your dietary needs. 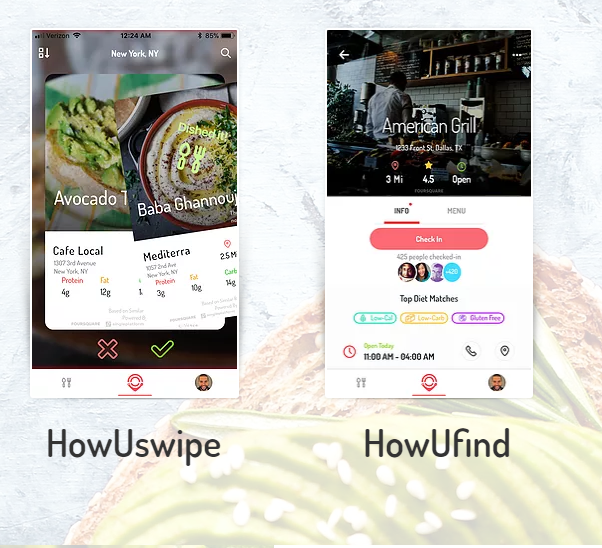 The HowUdish app is great for providing menu ideas at restaurants near you based on the type of "diet" you want to follow. They will then suggest meals in your area that you may be interested in. You can click a checkmark or an "x" depending on if you like that restaurant idea or not and it will save it for you so you have a list of restaurants in your area that you may be interested in. They suggested several restaurants that I have been wanting to try within a 15 mile radius of my home which is really neat. Adalyn has been a huge fan of going out to eat since she was a baby! I set my settings to "maintenance" mode and a general healthy diet. You can also input your weight and your weight goals if losing or gaining weight is something that you're interested in. You can find out the nutrition information for that meal before you go to the restaurant. With the premium setting which is $4 per month, you can also get recipes for different meals. It shows you the hours that the restaurant is open, the address and the types of diets that it is good for (ex: vegetarian, low-calorie, low-carb, etc.). This is helpful information to be able to find all on one app. You can also rate the restaurant which will help other users to know which restaurants are the best. You can add photos of the food that you got as well which I love. I love seeing something that looks delicious and knowing that that is what I want to order. Just to note, the app is newer and some of the features are still getting added and it will be even more helpful once it is all together. As someone who loves to peruse menus before going out, I think that this app is super helpful and has a ton of potential! You can download the HowUdish app in the Apple App Store. Disclosure: This post is sponsored by HowUdish. All opinions are my own.